The Department of Public Safety is offering CPR/AED training to the John Jay College Community. The next CPR/AED training will be scheduled shortly. If you have an interest in attending the training e-mail publicsafetytrainings@jjay.cuny.edu. Please notify publicsafetytrainings@jjay.cuny.edu if you would like to attend a First Aid training. We are trying to gauge if there is enough interest to conduct this training. Classes will be filled on a first come, first serve basis. There will be a $20.00 per person fee to cover materials and certificates, which must be paid directly to the Bursar’s Office. Advise the Bursar's Office that the payment is to be applied to the Public Safety Training account. We look forward to seeing you at the training. Public Safety has regularly scheduled Public Safety escorts after evening classes. Students, faculty, and staff who would like to avail themselves of that service should arrive at the 10th Avenue Public Safety desk by either 8:45 pm or 10:15 pm when officers will depart for the Columbus Circle subway station. This initiative is thanks to the Student Council and your Campus Security Advisory Committee members. MISSION STATEMENT: To improve student success by safeguarding and protecting all persons and property within the college’s diverse community. 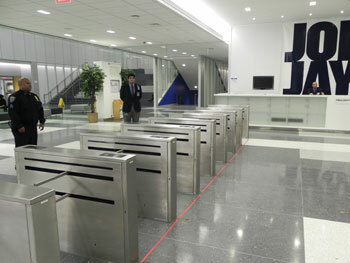 The Department of Public Safety is committed to the safety and security of each student, faculty member, staff employee and visitor at John Jay College. The Department of Public Safety strives to provide a high level of customer service that shows courtesy and respect for each individual and supports the educational mission of the college. Monday - Thursday: 9:00 a.m. – 11:00 p.m.
Fridays: 9:00 a.m. – 9:00 p.m.
Saturdays: 9:00 a.m. - 5:30 p.m.